Khabar: H-1 and H-4 Blues! Part 1: H-1 and H-4 Blues! The lives of tens of thousands of Indian immigrants will be uprooted and destroyed if the Trump administration moves ahead with its hardline proposals regarding these hard-working, tax paying, legally arrived immigrants. Here’s a look at how the proposed changes in immigration policy play out on the ground, with narratives that are poignant, and sometimes, plain desperate. Poornima Reddy*, an experienced data engineer, is enjoying her dream job at a Fortune 500 company. But this achievement, and the untold amount of heartache and hard work that had brought her this far, is about to be washed out, thanks to the Trump administration’s nasty campaign against immigrants, even when they are legal. The administration has set in motion the wheels to reverse the provision of EAD (Employment Authorization Document) for H-4 visa holders such as Reddy, which allows them to work in the U.S.
* (name changed for privacy) Sandeep Battula was only six years old when he came to America—it is the only country he has known. A legally arrived immigrant, who joined his legally arrived father who was on an H-1 visa, Battula’s dependent status has nevertheless been a bane of his American life. In college he couldn’t qualify for any FAFSA/Student loans or any kind of public financial support, because he was regarded as an international student despite the fact that a majority of his primary education was in the U.S.
Now, at 21, Battula is in a gloomy predicament. 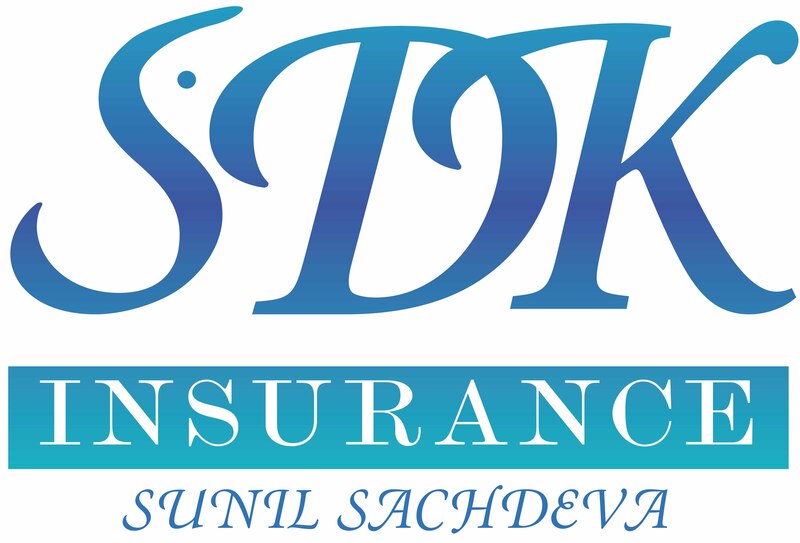 “If I do not find a job immediately, I have to move to India, which I do not call my home, as I have never been to India in these 15 years except for a very short visit of 15 days in 2009. The U.S. is my home, it is where I grew up, and where I plan to grow old,” he says. Reddy and Battula are just two of the tens of thousands of legal immigrants on H-1 and H-4 visas whose lives are in limbo due to both the unreal backlog in the process of converting the H-1 to permanent residency, and the proposed reversal of the EAD for H-4 visa holders. From driving on the right side of the road and understanding the nuances of baseball, prom, and American politics, thousands of Indian immigrants have, for decades, adapted to the American way of life, raising families, contributing to the economy, and becoming an integral part of local communities. For many such desis who entered America on an H-1B visa—and the hope of a Green Card—the time they have spent in the U.S. may soon come to a rude end. As tough new immigration policies roll out, individuals and their families are in a rough place. While their existence in the U.S.—ranging from a few years to over a decade—is now precarious, there’s little for them to go back to in their native land. For years, even as the H-1B visa holder—and family breadwinner—waited for the ‘almighty’ Green Card, the spouse’s life was very different and nowhere as promising. Such spouses, typically women, led cloistered lives in America. They lived on the periphery of the American Dream with the H-4 visa, a caged bird who could not soar to new opportunities. They could not work or have a professional life in spite of having been earning professionals in their home countries. They could not have a driver’s permit, a bank account, or a social security number. If they happened to be in a bad marriage where there was domestic abuse, they were further powerless and fearful of reporting to authorities, since they and their children were financially dependent on the working spouse. Dewan, who represents many such women on behalf of Manavi, the New Jersey-based group against domestic violence, has seen many such cases where women on H-4 visas have been abused by their husbands. Then in 2015, during the Obama Administration, the H-4 spouses got a life-saver, a gift: the eligibility to work in the U.S. while the H-1B visa holder waited for Permanent Residency status. According to a recent study by the Migration Policy Institute, the U.S. has issued employment authorization documents (EAD) to more than 71,000 spouses of H-1B visa holders, over 90 percent of whom are Indians. The H-4 EAD—a temporary employment authorization—was a game changer for many H-4 spouses, allowing them to drive a car, fulfil professional ambitions, and have an independent life. These families have been able to plan for the future, buy a home, and have expanded dreams based on two incomes, all the while contributing to the local economy. And now just as suddenly, the Trump administration is all set to strike harsh notes in this happy interlude. The administration may take away the right to work, now in force for two years. If the H-4 EAD visa is rescinded, it could impact more than 70,000 H-4 EAD visa holders and their families, the majority of whom are Indians and mostly women. “Our plans include proposing regulatory changes to remove H-4 dependent spouses from the class of aliens eligible for employment authorization, thereby reversing the 2015 final rule that granted such eligibility,” wrote U.S. Citizenship and Immigration Services (USCIS) Director Francis Cissna in a letter to Senator Chuck Grassley, quoted in BloombergQuint. And so, now, the spouses of H-1B visa holders are once again in a bind, their lives again upturned as they wait for the other shoe to drop. Can the lack of a piece of paper diminish, suffocate, and etch life in black and white? It can and it does when it is the H-4 EAD. What is it like for the ordinary folks whose lives have been snagged by this abrupt and dramatic policy change? Here are some stories of what’s happening on the ground. Rashi Bhatnagar (right) is not giving up without a fight. To create awareness of the problems facing H-4 visa families, she has turned to advocacy and has launched a Facebook support page. She believes that revoking EAD will definitely destroy the lives of many H-4 visa holders. The H-4 EAD Rule should be retained or a permanent immigration solution should be given by the Administration. Bhatnagar suggests, “They could give unused visa numbers to clear the Green Card backlog, remove the dependents from the Green Card line, or give an early adjustment of status." Bhatnagar is not giving up without a fight. 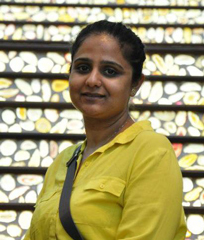 To create awareness of the problems facing H-4 visa families, she has turned to advocacy and has launched a Facebook support page (https://www.facebook.com/H-4visaacurse/) that portrays the multiple problems of H-4 spouses. For instance, there’s the issue of non-U.S. born, “aging out” kids who are stuck on a dependent visa. The clock is ticking and as they wait for Green Cards to come through, many of the waiting children are turning into adults. Once they are 21, they can no longer be a part of the family Green Card application and will be sent back to their original home in India, which they may not even remember. The SIIA GA team recently met with officials from the offices of Georgia Senators Johnny Jackson and David Perdue in Washington, D.C. The group was also part of a 500-strong gathering of skilled immigrants in D.C. who met with legislators. Poornima Reddy* (name changed for privacy), a merit student, grew up in Hyderabad. In 2003, her superior technical skills landed her a job in a software company where she was awarded thrice for her contributions over a 5-year period. From 2017, after her graduation, after almost eight years of constant hard work, she started working as a Big Data Engineer with a Fortune 500 company. For a data engineer, this is a dream job. Now, this dream may be receding for Poornima. “I’m really not here to make millions of dollars. I just want my identity as a dad and as an individual, have the family together, and live peacefully. Now if they reverse the EAD rule, it will shatter all our dreams. 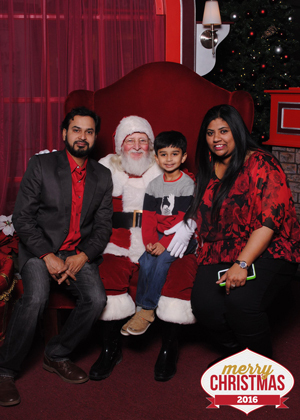 Our family has nowhere else to go,” says Raj Karne, seen here with his family. With the Karne family who live in Minneapolis, Minnesota, there’s a role reversal. 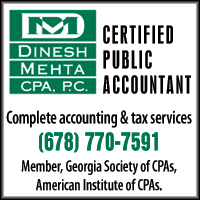 While his wife received an H-1B visa in July 2011, he came to the U.S. on a dependent visa. Sandeep Battula was only six years old when he came to America—it is the only country he has known. He was born in Visakhapatnam, India on November 20, 1996 and came with his mother and sister to join his father, Venu Battula, who was in the U.S. on an H-1 visa. Fifteen years later, the family is still waiting for their Green Card which is bogged down in backlogs due to the per country quota limits. In the intervening years, Sandeep has grown into a young adult. Sandeep has now graduated from Ohio State University with a Bachelor of Science in Computer Science & Engineering. He is currently pursuing a Master of Science in Computer Science at Michigan Technological University in Houghton, MI. Even if his father’s Green Card comes through, the job market will also be closed to him because he has aged out. 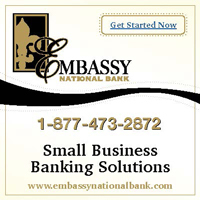 It is a story of learning to downsize, to dream small, to dream cautious. 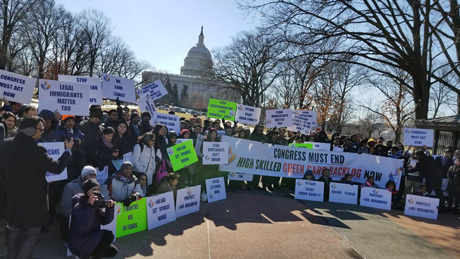 Skilled Indians met with legislators in February 2018 to address the Green Card backlog. 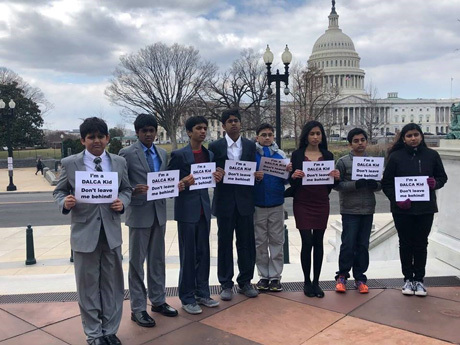 Meanwhile, the H-4 visa holders have presented their concerns to senators and lawmakers and tried to highlight their plight through the media. It is a battle which will have to be won by raising voices, raising awareness. 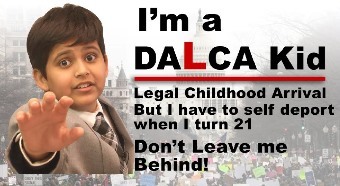 DALCA (Deferred Action for Legal Childhood Arrivals) children making their voices heard at the Capitol. Meanwhile, it’s a waiting game. “I think the government’s intention is to revoke it or rescind it. It’s a low-hanging fruit for them. There’s every indication that Homeland Security and the USCIS are determined to rescind the H-4 EAD Rule,” says Tahmina Watson of Watson Immigration Law, an immigration attorney in Seattle, WA. The rule does go through a process where there are 30-60 days for the public to comment. In a general rule making process, the government will take all the comments into consideration and then make the final rule. It’s difficult to know whether this will now be adhered to and how it will all end. I could only stay at home and take care of my baby even though I have sufficient financial analysis and accounting skills from my M.S. study at a famous business school in the U.S. It is an obvious waste of my education and experience. All the financial burden of my family is on my husband, and my family, [including my] 6-month-old baby, can only live in a life with significant financial constraints. Due to this issue, I and my husband, a Ph.D. from a top engineering school in the U.S. are even thinking about leaving the country to other immigration friendly places to start our careers better. [I am a] a contributor to [the] U.S. economy and paying my taxes without dues for the past seven years, and I still continue to work hard to improve the U.S. economy. I would support this rule which will in turn change the U.S. economy and as well improve our families with H-4 dependents. The H-4 dependents are more like a caged living being suffering for their rights in USA. My wife has been on H-4 for last 7 years which has made her depressed. She is an Echo cardiograph technologist by profession and she was working at a super specialty hospital as a head of her department before our marriage. She had [a] lot of dreams that she can show her excellence in her career in USA. But because H-4 dependents don't get an SSN and work permit, she was forced to do nothing in her career for last seven years. I was at the second highest post in my company back in India where I worked as programmer and senior developer, project manager, and also as HR Manager. I am here since 2008 July and I have already wasted six years of my career. Also, I have lost self-confidence and am totally dependent on my husband. It’s really a big concern for independent and highly educated women like us. The most important benefit for me with EAD is being INDEPENDENT! It will help USA because I will be paying taxes and also give my best to the community in all ways that I possibly can. Immigrant Engineers Power American Industry Giants, Why Lose Them? Due to not having a work permit I [have not been able to] apply for a job since 9 years. 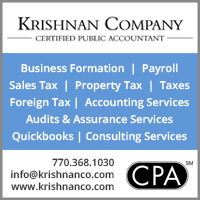 I am on H-4 visa, dependent on my spouse financially. I think one of the things that is rather underappreciated is the level of talent the engineers from other countries bring to the U.S. Immigrant engineers are working on cutting-edge technology projects at Facebook, Twitter, Google, Apple, Microsoft, etc. They are the 'real contributors' to innovation. By not allowing their spouses to work in the U.S. there is a risk of losing the entire talent pool, and in effect, a lot of innovation. Give work permits to H-4 visa holders: Unlock their hidden talent. America should help the H-4 visa holders to become a part of the economy. There should be a pathway for the H-4 visa holders to get legal jobs so that they do not take away the (H-1 visa holders’) skilled labor that is already innovating and creating new jobs. You’ve heard of DACA, or Deferred Action for Childhood Arrivals. But what about DALCA, or Deferred Action for Legal Childhood Arrivals? The distinction is that the DACA pathway to citizenship only applies to children who were brought here illegally. For many Indian-Americans, the DALCA voice is being ignored. The absence of any congressional or media discussion on the issue is a sad scenario, leading to a brain drain in the U.S., notes VIKRAM ADITYA KUMAR. “I wish I were an illegally arrived child instead of a legal one.” As a stand-alone statement those words are perplexing, but in present context it serves as the mantra of 200,000 Indian-American children who were brought here legally by their parents on H-1B or other work visas. Those children now face the real threat of self-deportation once they turn 21 years old due to the end of their H-4 dependent status and a seemingly endless backlog of green card dissemination. I was lucky enough to have been born in this country in the early ’80s to parents who came here from India in the late ’60s on student visas and who subsequently got their American citizenship. Compared to Indian immigrants today, my family and I are generationally lucky. The young people who are losing their legal status are no different than my siblings and I were. These kids have been raised on Dorito’s, PlayStation, and Coke just like we were and now they’re being forced to leave—which benefits “Silicon Vancouver” and beyond. Each high-skilled worker who is forced to move is a loss for the U.S. and our future as a competitive tech country. Nearly a dozen Indian families in my friend circle alone have shipped off to Vancouver. Prior to the new millennium it would only take six months to get a green card. Now the wait is up to 60-70 years. Many H-1B holders will die before they get a green card. And they will continue to live a life of uncertainty and deep anxiety, afraid to go back to India to even attend the funeral of their parents for fear of being not allowed back even though they have a legal status. There has been zero debate of the DALCA issue in either the House or Senate and the only real mentions of it anywhere are in India-based periodicals since it affects Indian-Americans more than any other minority (70 percent of EB visas have been awarded to Indian-Americans in the past decade). Congress needs to address this problem and include the DALCA Dreamers in whatever compassionate fix they intend to bestow upon the DACA Dreamers. We cannot let this talent spill out of our country, which will in turn deter continued growth and prosperity. And Congress must fix the root-cause of the DALCA problem: the 60-70-year backlog of high-skilled immigrants from India. To me, this is an easy DALCA fix: simply adjust the White House policy on DACA by including the word “legal” in its immigration framework. Vikram Aditya Kumar is president and CEO of AVG and chairman of Republican Hindu Coalition. A slightly different version of this article appeared in Real Clear Politics.